Bouquet de Verendael tapestry shows a work by Nicolaes van Verendael (1640-1691). This Flemish painter was famous for his paintings of flowers in vases. Here we see an abundance of flowers in a vase on a ledge. Reds, oranges and creams contrast with the green foliage, on a dark background. A decorative border completes the work. 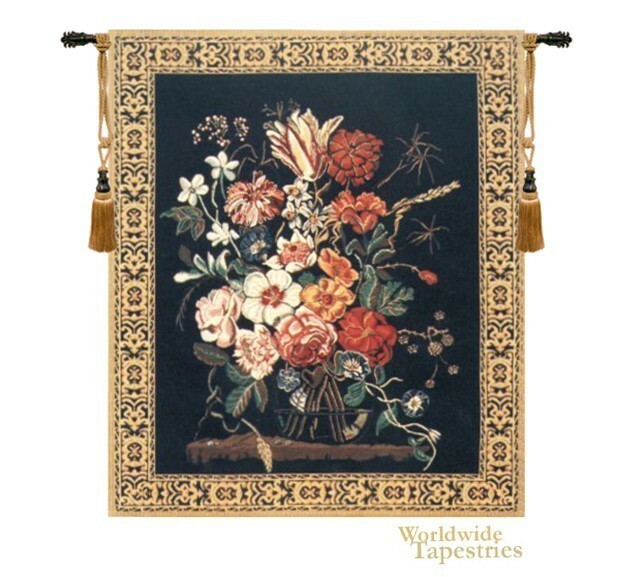 The Bouquet de Verendael tapestry is backed with lining and tunnel for easy hanging. Note: tapestry rod and tassels, where pictured, are purchased separately. Dimensions: W 57" x H 69"